‘Tis the time of the year where either myself or my husband are at Sam’s Club every two or three days. We enjoy celebrating, cooking, being with family, and buying lots of food in bulk is helpful. In between all of this holiday merriment, I still have to be “mom” and cook hearty dishes for the kids that will power them through this busy season. 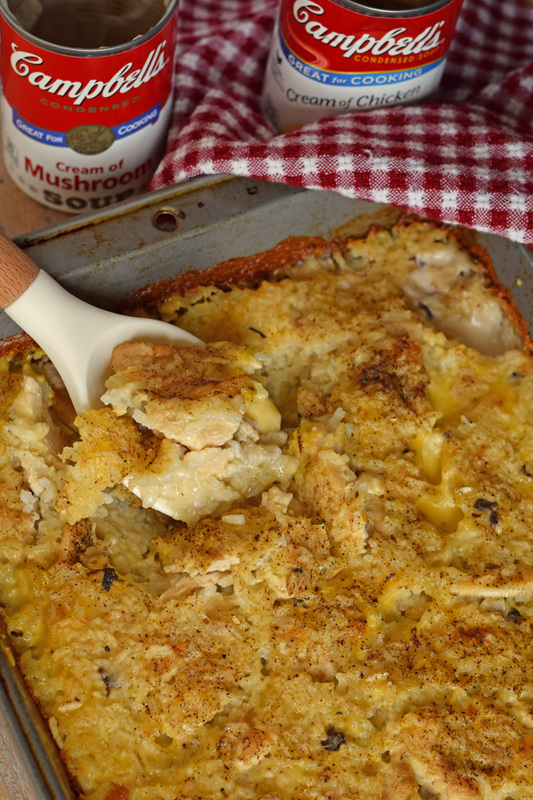 With only a few ingredients and one pan, this Quick and Easy Chicken and Rice Casserole is a weeknight hit! Another great thing about this recipe is that it is customizable. Add different spices or even a few veggies based upon your family’s preferences. Hover over the image below to shop ingredients for this recipe. Grab a 13 x 9 pan and spray generously with olive oil non-stick spray. Pour the Swanson® Chicken Broth, Campbell’s® Condensed Cream of Chicken Soup, Campbell’s® Condensed Cream of Mushroom Soup, black pepper, Pink Himalayan sea salt, rice, and cubed chicken into the pan. Stir all the ingredients together. 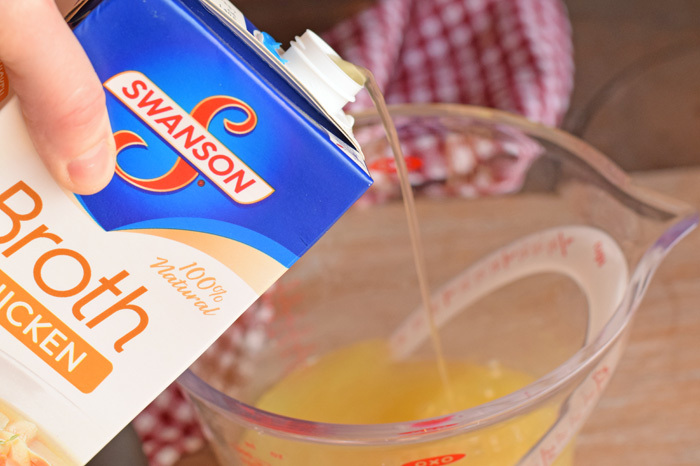 Notice the resealable Swanson® Chicken Broth packaging below? Swanson® is 100% Natural with nothing artificial added! Both ingredients below contain no artificial colors, flavors, or preservatives! In small increments, add the ghee to the top of the dish, spreading them evenly over the food. Bake for 45 minutes. Pull the dish out of the oven and stir. If the rice or chicken is not finished, place it back in the oven for 10-15 minutes. My kids get excited every time I make this recipe. We were first introduced to it when my friend Mary brought it to our house after my husband and I had given birth to a baby. I’ve tweaked it over the past few months (the ghee and Pink Himalayan sea salt make a tasty difference), and I’ve taken it to a few friends who are going through challenging times themselves. Christmas is an exciting time, but it isn’t always for everyone. There are so many people hurting in this world, and sometimes a visit and a casserole can make a delightful difference in their day. This recipe is easy to make and “give back” because of its ease of cooking, clean-up, and portability. Grab a pack of disposable aluminum pans while at Sam’s Club and keep them on hand for when you want to take a meal to someone deserving. 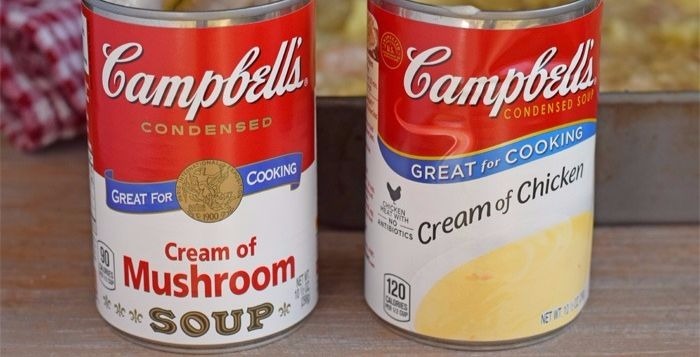 Swanson® Chicken Broth, Campbell’s® Condensed Cream of Chicken Soup, and Campbell’s® Condensed Cream of Mushroom Soup are helpful cooking items for recipes that food bank employees can distribute to those who need them. The convenient 10-pack pantry packs from Campbell Soup Company make it easier! Our family donates to two food banks. Our church has a food pantry where we distribute food to those needy and local around the church community. My husband and I also donate to the Second Harvest Food Bank. They are a local food bank that serves as a hub and distributes food to other, smaller food banks in surrounding counties. Buy all the items that you need for entertaining or donating at Sam’s Club. On December 21 and 22, Sam’s Club will be hosting their annual Holiday Taste of Sam’s event. Swanson® Chicken Broth will be available for sampling with Idahoan Mashed Potatoes. In addition to sampling, members will also be able to take advantage of a temporary price reduction of $1.50 off Campbell’s® Condensed Cream of Chicken Soup and Campbell’s® Condensed Cream of Mushroom Soup. I found my ingredients for this recipe on a special display up front (near Member Services). What is your go-to recipe for this time of the year? I just love it when I am looking for recipes and I have all of the ingredients needed already without having to go to the store! This is going to be made for dinner TONIGHT! This is one of my favourite recipes! When I was a new wife (12 years ago), I would make this all the time for my husband. I haven’t made it in many years! This is a great reminder! I bet the kids would be thrilled! We are at Sam’s Club on pretty much a weekly basis. Stocking up on staples for less is a must with hungry boys in my house. 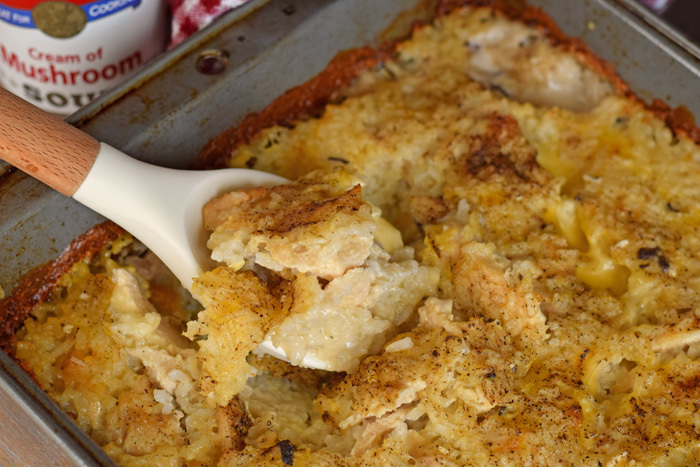 This casserole looks like a great option for dinner at our house. YUM! We make a similar casserole and we love it. 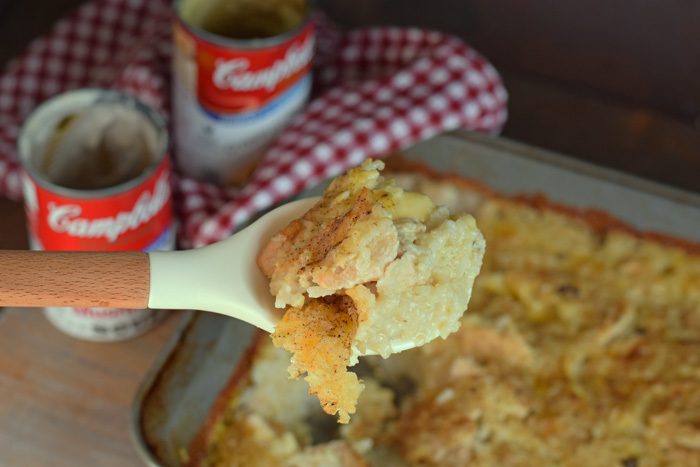 This time of the year we have so many traditional casseroles we love making for side dishes or even meals. I love shopping at Sams for products like this. A great way to be prepared for the holidays. We love this recipe!! We make one much like it. Chicken and rice are a family favorite and it is so easy to make. The kids dont complain and i dont have to worry about them missing a meal. 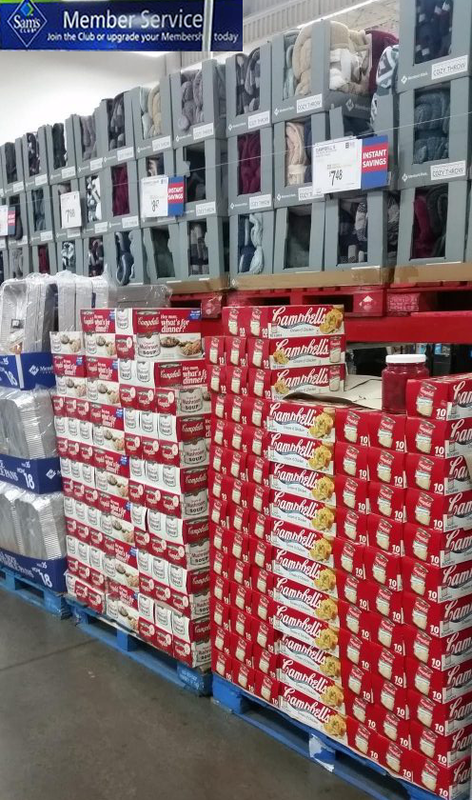 We love Sam’s Club and I try to visit them every month. The Chicken rice casserole looks yummy, I can remember my mom making this recipe for us when we were younger and it was good then also! I need to make this one for the family, I’ve never made it. Thanks for sharing recipe. You had me at quick and easy. This looks amazing! This dish is a staple in our house! I am glad you liked it and made it your own; I will have to try yours sometime!